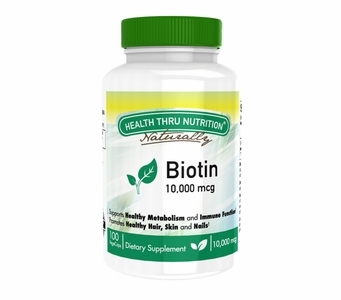 Biotin, a water-soluble B vitamin, assists in the metabolism of fatty acids, proteins and sugars in our body and is renowned for its ability to strengthen nails, thicken hair and improve skin conditions, reducing the effects of aging. In addition, recent studies are showing positive outcomes for diabetics taking biotin supplements; biotin stimulates the pancreatic secretion of insulin, thereby lowering blood glucose levels in both type 1 and 2 diabetics, as well as improving symptoms of diabetic neuropathy. Like all water soluble vitamins, biotin is regularly excreted from the body and should be consumed daily for optimal absorption and results. Natural sources of biotin include carrots, swiss chard, legumes, eggs, fish and berries, or you can always opt for a supplement to ensure daily vitamin restoration. Health Thru Nutrition offers 10,000mcg of biotin in 1 easily absorbed capsule, providing you a full day�s worth and then some of beneficial Biotin! Free of: Milk or milk by-products, egg or egg by-products, fish or fish by-products, shellfish or shellfish by-products, tree nuts, wheat or wheat by-products, peanut or peanut by-products and soybeans or soy by-products. Directions: Adults: Take one (1) vege capsule daily as a dietary supplement or as directed by your healthcare professional.